This month at Allergic to Salad, we’re celebrating root vegetables of all shapes, sizes, and colors. While produce at the farmer’s market may dwindle as the weather gets colder, sweet potatoes, beets, and celeriac remain, offering heartiness and earthy flavors to a winter recipe repertoire. People around the world have been eating root vegetables for thousands of years. While many may associate potatoes with Ireland, the tuber was actually cultivated around 8,000 years ago in Peru, when Inca tribes grew them as a vital source of energy. Meanwhile, in the tropical Pacific Islands, Native Hawaiians grew taro, a starchy tuber that was steamed and mashed into poi. Over 2,000 years ago in Europe, the Romans began planting and consuming parsnips, a cousin of carrots. The fact that all of these root vegetables are still grown and eaten today is testament to their incredible longevity. Today, we’ll be focusing on sweet potatoes, one of our absolute favorite root vegetables. Native to Central and South America, the tuber has made its way around the globe through Polynesian voyages and European colonization. Rich in fiber and vitamin A, it makes a nutritious addition to soups, salads and stews. 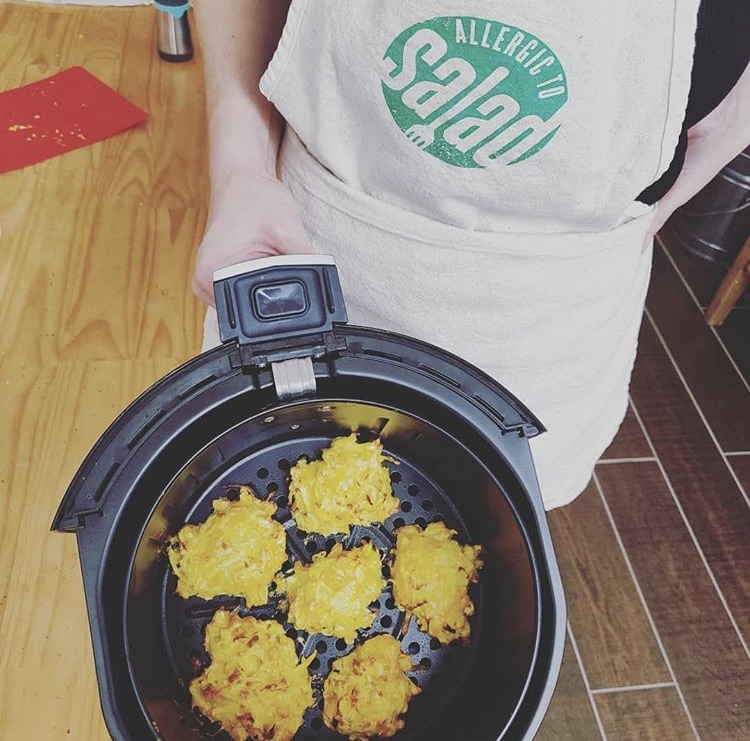 We’ll be using them in a tasty holiday recipe: sweet potato latkes! Latkes are an important part of Jewish culinary traditions and are usually served during Hanukkah, which begins this Sunday, December 2nd, at sundown. Long ago, a tyrannical king from Syria ruled Israel, taking over temples and preventing Jews from practicing their religion. A small band of brothers fought valiantly to gain their most beloved temple back, but when they entered, they found it in shambles. With a bit of oil they found, they lit their golden menorah, only expecting the candles to burn for one night. Miraculously, it kept burning for eight whole nights! We celebrate Hanukkah and fry latkes in oil in honor of this auspicious occasion. While you can eat your latkes plain, we love dipping them in sweet homemade applesauce. Together, they make a delicious snack, appetizer or light dinner. Add all applesauce ingredients to a sauce pot set over medium-high heat. Cover and bring to a boil. Stir, reduce heat to medium and simmer 20 minutes, covered, mixing every so often to help cooking. Grate sweet potatoes and onion using the largest setting on a box grater. Spread potatoes and onions on a paper towel, cover with more paper towels and press to remove as much water as possible, set aside. Whisk together egg, flour, cinnamon, and salt. Stir in potatoes and onions, mixing to combine. Warm about 1/4-inch of olive oil in a skillet over medium-high heat. Place a scoop of potato mixture into the pan and flatten with a spatula. Fry until darkly golden, about 6 minutes, flip and fry another 5 to 6 minutes. Transfer to plate lined with paper towels and continue. Serve with applesauce. What are your favorite root vegetables? Let us know in the comments below. 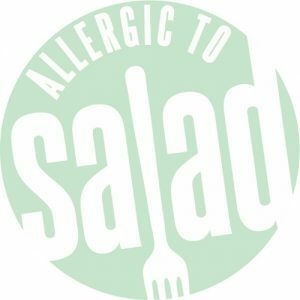 Happy holidays, Allergic to Salad readers! We hope you enjoy cooking and spending time with your family and friends, no matter what you celebrate.